attendance, leave, vacation and payment! We are excited to announce the release of the new online version. Please feel free to test drive and give us your feedback. We continue to support the desktop version. Managing employee time and attendance data can be overwhelming and time-consuming. As a business owner, there are few things more valuable than a tool that puts more hours back into your day, simplifies your life, and saves his money that you can re-invest into your business. Our ezTimesheet Software handles regular, overtime, sick and vacation payment. It will automates the time tracking and payroll process. 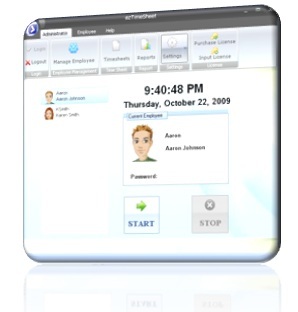 You can use it as PC Punch Clock software or you can installed on multiple machines to enter time manually. What ezTimeSheet does for you? It reduces payroll costs . Due to overlapping time clock entries, the average employer overpay is 2.5%. ezTimeSheet eliminates this problem. The program calculates time and gross pay automatically, preventing the need for owners or administrators to complete the task. ezTimeSheet is easy to use even for people with no accounting and computer background. 5-employee version starts from only $39. You can even get 5-employee version for free through TrialPay offers. 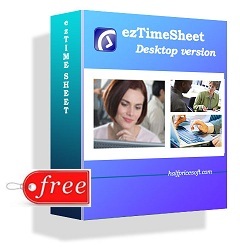 You can download ezTimeSheet for free, with no cost and no obligation.. Administrator can export screen report to different formats: excel or PDF or image format. Adminsitrator can export paycheck data to file. 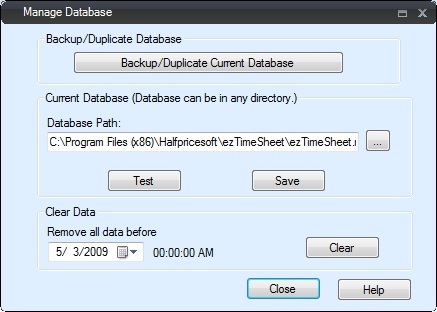 EzCheckPrinting software can read the data from print checks on blank stock or pre-printed checks. ezTimesheet program works on Windows 98/NT/Me/2003/XP/Vista/7/8/8.1/10, 32-bit/64-bit system or MAC machine installed with Virtual Machine or Parallels. How to share the database over network? How to export ezTimeSheet data to ezCheckPrinting and print checks? (No CD included) free No Key needed. The license key will be sent to your email account automatically once the transaction is done. If the message is blocked by your mail server, please contact us at services@halfpricesoft.com. The software on the CD is the same as the one you download from our site. The CD option does not include the license key. If you can download this software from our site, you do not need the CD. You can just purchase the license key. The CD is for the users who cannot download software or who wants to keep a hard backup copy. How ezTimeSheet Employee Attendance Tracking Software works? The employee clocks in and clocks out. 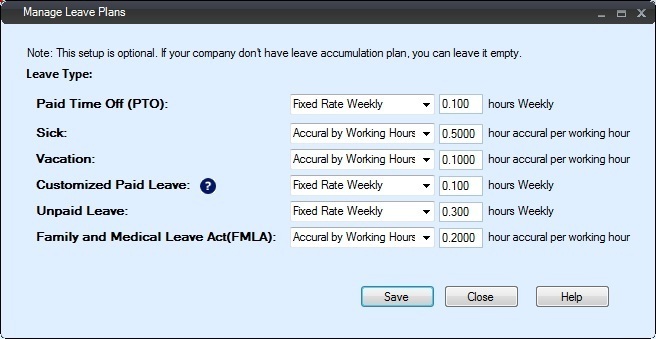 Auto-calculate PTO, leave time, vacation time, sick time based on the accrual plan -NEW! Track available leave, used leave, and create Leave Reports -NEW! Track available vacation, used vacation, and create vacation Reports -NEW! Track available sick time, used sick time, and create sick time Reports -NEW! 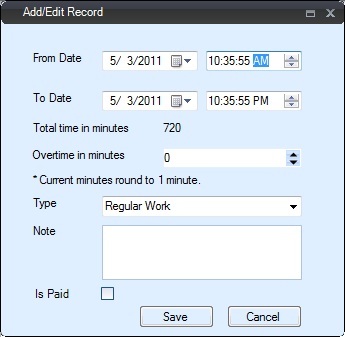 HR can use ezTimeSheet together with ezPaycheck or ezCheckPrinting to generate payroll checks. 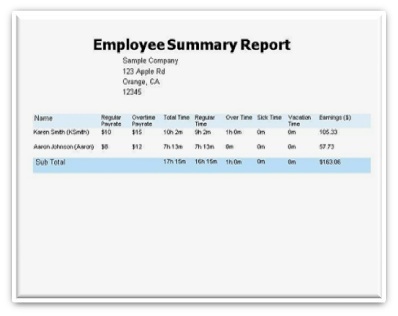 HR can generate detailed reports for each employee. 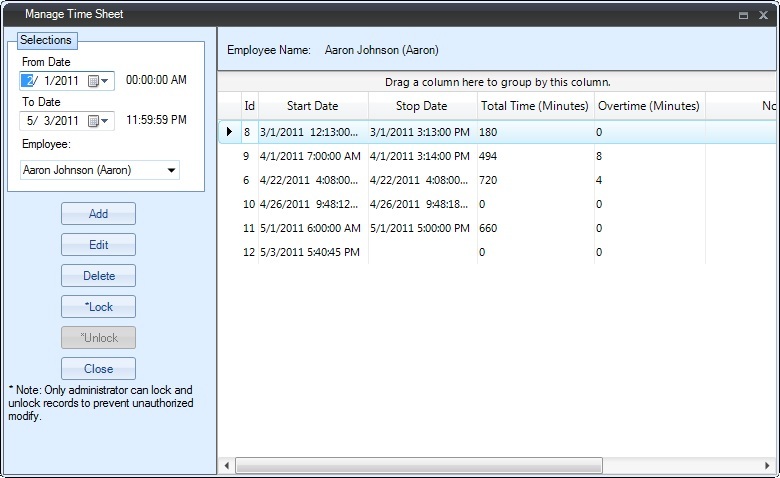 Employee can log in to add/edit timesheet data if administrator enables this feature. Only unlocked data can modified. Admin can click top menu "Administrator->settings->Manage Leave Plan". ezTimeSheet supports PTO, Sick, Vacation, Unpaid Leave, FMLA and a customized Paid Leave. User can select Fix Rate plan or Accural by working hours plan. Admin can log in to generate customized report by employee and date range. A lot of users like to use ezTimeSheet together with ezPaycheck. You can use ezTimeSheet to track employee time and attendance. You can use ezPaycheck to handle your payroll job. ezCheckPrinting - business check writing and printing software. If you need to print paycheck for contractors, please try ezCheckPrinting. You can export data from ezTimeSheet and import the data into ezCheckPrinting. You can get this check printing software and compatiple check paper for FREE through our special promotion program. State Tax and Revenue Websites. Federal Tax and Revenue Websites.